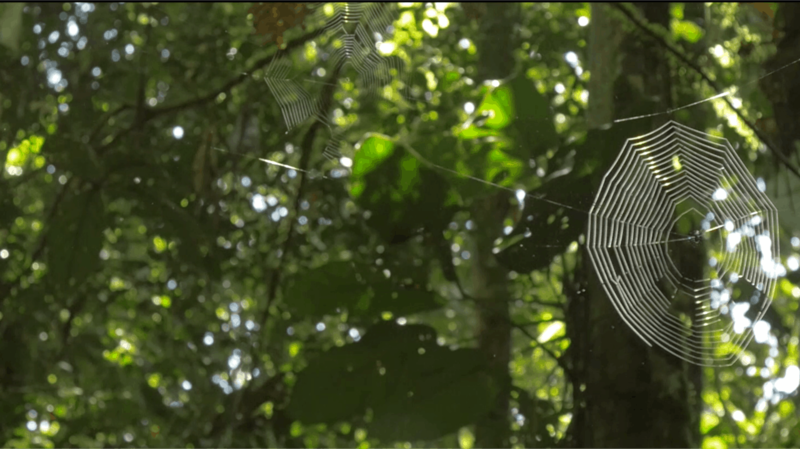 Discover what inspired filmmaker Nick Werber to specialise in rainforest conservation, taking him to the remote Peruvian Amazon to work with Crees scientists on groundbreaking research projects. For some reason, at the age of 12, I fell in love with the rainforest. I first fell in love with the thought of it. Its wildness and abundance called out to me. From my drab suburban world I imbibed its rampant green goodness from photographs and nature documentaries. I marvelled at the wildlife, flagrantly colourful and yet shy and elusive. I was bored by my urban existence. In the jungle, it seemed, magical secrets still lurked. And then I heard about its destruction. I saw news reports of bulldozers and chainsaws shredding the forest, stripping the trees and loading logs on to a endless stream of trucks and lorries. I saw the red earth exposed, and a burned out wasteland emerge like a scratched blister spreading into the green. I felt I had to do something about it. And so at aged 12 I wrote a report in school of what I’d seen. I learned about the lush biodiversity, the potential for medicines and I saw native people who lived deep in the jungle, away from our cities, our factories and our noise. I first heard about the speed of its destruction, 100 football fields per second, and I counted to a minute and imagined it expanding like a cancer. I felt powerless and so I joined Greenpeace. I gave a few pounds per month, whatever I could afford, and I telephoned them and asked what I could do. I said I would lay down in front of a bulldozer, whatever it took to help, though I was told, to my disappointment that the best way I could help would be to keep giving money. And so I waited, life took over and the call of the forest became a low refrain playing somewhere in the background. And then, one day, after I graduated from a journalism and creative writing degree, I saw a job posting for a ‘rainforest journalist’. It was for an organisation called the ‘Crees Foundation’ and it was tagged as ‘the best job in the world’. I applied, and after a long interview, where I met Quinn, the founder, I was lucky enough to get the job. Two weeks later I arrived in Peru. It was my first time in South America. I touched down in Cusco and felt tantalisingly close to the forest, just a day’s drive away. A week later I travelled to Manu, plunging from arid high Andes down to thick forest, meeting the Madre De Dios river at Atalaya . Beyond the riverbank I glimpsed the green peaks stepping into the distance and felt a rush of excitement. After a boat ride over the rapids, we docked at the Manu Learning Centre (MLC) and, like Alice, I stepped into a new and wonderful world. My first weeks in the jungle were a learning curve. I began to write articles, and take photographs. I discovered the rule of thirds, aperture, ISO, and shutter speed. I captured life at the MLC – a world of hummingbirds, Oropendulas, and the dawn chorus of all life awakening. At night, sleeping in the open air, with just a mosquito net, I slept deeply and woke with delight to the hoots and trills of the jungle. I met local people in the town of Salvacion. They were shy, self effacing and taciturn. But over time, as I grew to know them I found them to be warm, open and always with a welcome smile. They had hopes of better lives, for them and their children. They were eager to learn about the wonders of the forest and how they could work in a more sustainable way. Over the years I grew to love Salvacion and returned this year to film it and document life in a rainforest town. Working with biologists at the MLC I learned much about research methods, about animal roles and habits. I learned about symbiotic relationships, such as that between Pseudomyrmex dendroicus, a species of fire ant that lives in and protects the Tangarana tree. In learning so much I became invigorated and excited to document my experiences through writing, photography and film. In 2011, I decided to improve the level of work I was producing and brought a friend, Dan who had experience with filming. Together we made the film ‘Reynaldo, rainforest hero.’ Which follows Reynaldo Ochoa, Crees agroforestry expert as he talks about his own journey to sustainability in the Amazon. The film won 3 awards, including the United Nations forest film prize. After that brief taste of success I wanted to continue to make films and improve each time. I spent some time in London where I studied at a communication school, returning to Peru in 2015 with new camera equipment and the goal of filming, completely solo. I had worked on other projects for Crees in the intervening years and had made documentaries in between but this was the first time I was to film and edit completely on my own. I spoke with Andy Whitworth, who at the time was the scientific coordinator at Crees and he suggested I make a film about two young female scientists who were conducting some ground-breaking studies in the secondary regenerating forest at the MLC. Jenny Serrano Rojas and Ruthmery Pillco Huarcaya at the time were biology students working on their thesis projects. Jenny was studying a poison dart frog believed to be a new species to science and Ruth was studying a family of Woolly Monkeys deep in the forest. For two weeks I followed Ruth and Jenny as they carried out their research. Ruth was an early riser, following the monkeys at dawn, often stepping off trail to pursue them for the whole day. Much of Jenny’s work was at night, hunting for frogs in streams equipped with a head torch. I found both of their projects fascinating and was captivated by their enthusiasm and dedication. For a fortnight, I rose at dawn and fell into bed often at midnight. I fumbled for the right lenses and rushed around the MLC holding interviews, charging batteries and backing up footage. The final films could have been better. Every project I work on is a series of lessons and I was lucky enough, thanks to photographer Charlie Hamilton James to get the Jenny film ‘Finding Frogs’ featured on National Geographic earlier this year. Jenny’s paper had been published by this time and there was some press interest in her new frog. Ruth’s Woolly Monkey film ‘Monkey Magic’ was perhaps seen by less people but was no less magical in my view. Ruth is a deep thinker, very committed to her work and she is tireless and fearless. She spent months following the Woolly monkeys, often walking for hours before she found them. Though diminutive in size, Ruth has a towering determination and I wanted to capture this by always filming with the camera looking up at her. This also captured her wonder at the forest. She had a quietly reverent view of nature and spoke of her love for the animals and her oneness with the jungle. In my own meagre way, through an often out of focus lens and sound wrought with the whirr of insects, I hope I was able to show both the beauty of the forest and the importance of these two passionate scientists and their work. The only advice I would offer to would-be journalists and filmmaker’s is to follow their passion. Read widely, work hard and keep moving forward. That’s what I tell myself, anyway.